Garry Balogh, FDOT Coordinator for Florida Scenic Highway Program gave short overview of the program. Anne Wilson, Chair of the group then known as North Flagler Scenic Highway, and Charles Helm, Chair of the group then known as Flagler Beach Corridor, provided background information on how their groups attained Florida Scenic Highway designation. Joe Jaynes elected as Chair of the new Corridor Advocacy Group (CAG.) Recording Secretary and Corresponding Secretary elected. Committees formed to write by-laws and prepare Letter of Intent. CAG met to begin process of preparing application for designation as Florida Scenic Highway for The Loop roads – Old Dixie Highway/N Beach Street, Granada Blvd, John Anderson Drive, Highbridge Road and Walter Boardman Lane. Historic Ormond-By-The-Sea Scenic Trail CAG (representing SR A1A from Granada Blvd north to Flagler County border) is also soliciting bids from consultants who will prepare FSHP application. Historic Ormond-By-The-Sea Scenic Trail CAG officially joins with OB Scenic Loop. We adopt new name of Ormond Scenic Loop & Trail CAG. Corridor is now a figure-8 loop which includes A1A, the original Loop roadways and Pine Tree Drive canopy section. A1A Scenic & Historic Coastal Byway (combination of several CAGs & CMEs to the north) holds ribbon-cutting ceremony in Marineland to celebrate their joining together under one umbrella. They invite OB Scenic Loop to join their umbrella when we receive designation. Application for designation submitted to Scenic Highway Advisory Board for review. Approximately 550 people attend the OSLT Designation Celebration at Tomoka State Park. Mayor Costello, County Council Representatives Carl Persis, Andy Kelly and Joie Alexander participated. Application submitted to Federal Board for designation as National Scenic Byway. Work is completed on 15+ month project to create and install interpretive signs at trailheads on Walter Boardman Lane and Pine Tree Drive, within Tomoka State Park. New trail cleared and foot bridge constructed at Pine Tree Drive which leads to newly-constructed wildlife viewing platform on Summer Pond. Projected funded by partner Halifax River Audubon. All work completed by volunteers. 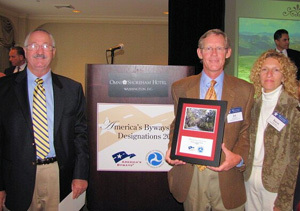 Mary Price and Karon & Joe Jaynes travel to Washington DC to accept National Scenic Byway designation. OSLT holds first public forum with introductions by CME Chair, Mayor of Ormond Beach and County Council representative. Two speakers discuss salt marsh restoration and prescribed burns to educate the public. Florida Department of Transportation produced a video about Florida's scenic highways which includes a section on the Ormond Scenic Loop and Trail. One-mile multi-use paved trail running through oak hammock in Tomoka State Park and parallel to North Beach Street segment of corridor opens to the public. This extends the sidewalk from Inglesea to the park entrance. Private dedication ceremony for Woodham Woods Trail in memory of Tomoka State Park Manager and OSLT Board member, Benny Woodham. North Peninsula State Park & St. Johns Water Management District begin Phase 4 of salt marsh restoration on John Anderson Drive. Earlier restoration phases show return of native wildlife and plants.